As some of you may have noticed, Ronin on Empty has not been updated in more than a month. Prior to this steep drop off in productivity, I had been updating my blog on an almost daily basis, as I was intentionally trying to fill the void between LoveHKFilm.com’s closure and its eventual return. To some degree, I achieved that feat, but I meant for this increase in activity to continue beyond the main site’s re-opening. Not only did I have the intention of writing more, but I also had the means, opportunity, and motivation to do so. Sure, I had an impending cross-country drive from California to Oklahoma. And yeah, I’d be heading to Michigan a couple weeks later. But I was prepared for how the trip might negatively impact the blog. In advance of the drive, I’d written a few rough drafts that I’d planned to polish for future use. At best, I’d post them using the free wireless at the various motels on our road trip. At worst, Ronin on Empty would go on a three-to-four day break. After that, I’d be back to my regularly scheduled blogging. Well, life had other plans. Unfortunately, due to reasons beyond my control, Ronin on Empty has been closed — and will be, at least for the time being. Now, I know what you’re thinking: like Webmaster Kozo’s once frequent, presumably tongue-in-cheek threats to quit LoveHKFilm.com, you’re probably wondering if my hiatuses — for school, for summer vacation, for general burnout — are turning into some kind of unintentional running gag. And perhaps these announced breaks were in danger of becoming a recurring, unfunny joke, but the reasons for this latest absence are all-too serious. A family crisis of some magnitude has compelled me to return home. I’m hesitant to even discuss it online, largely because the gravity of the situation is difficult to convey in words, much less deal with in the real world, so please pardon me for my reticence. Some may be surprised that anything at all is going on with me, as I’ve maintained a veritable mask of normalcy on my Facebook and Twitter accounts. But the truth is, things have been far from normal lately. Days before my road trip, my Dad was diagnosed with leukemia. He’s been hospitalized at OU Medical Center for more than a month with various additional health complications. It’s been said that “It’s always darkest before the dawn,” and I have to admit my family has seen some dark days in the last month or so. No words can express how bad it was. But I’m also happy to report that, in the last few days, we’ve just seen the dawn on the horizon. We’re just waiting for it to shine through. I have confidence that it will. As things develop, I’ll keep you posted. Until next time, I leave you with a bonus installment of my running column, Great Moments in Hong Kong Cinema. It’s from a little movie called Chungking Express, one the very best films Wong Kar-Wai ever made. If you haven’t seen this movie and you’re a reader of this site, please do yourself a favor and rent/buy/see it now. 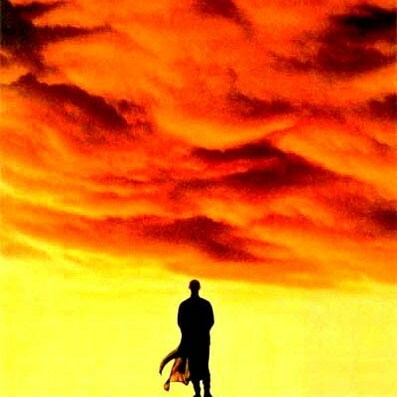 The ending won’t mean much to you out-of-context, but for those who have seen the film, you’ll know that it ends on a note most Wong Kar-Wai films don’t. …on a note of hope. Periodically, Ronin on Empty will be taking a look back at some Hong Kong cinema classics, albeit with a specific emphasis on “Great Moments” — i.e. 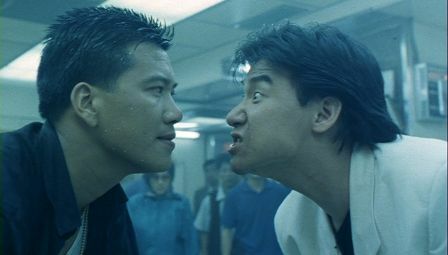 classic scenes that no Hong Kong cinema fan (old or new) should miss. Of course, “classic” will not only entail super-cool, gobsmacking moments, but also the downright ridiculous stuff, too. 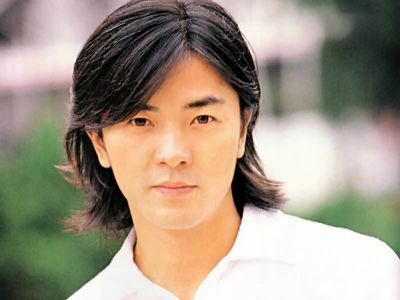 The May 6th episode of the NBC comedy Community featured a dead-on parody of some of John Woo’s films (particularly those featuring Chow Yun-Fat), which got me to thinking about some of the best scenes from Woo’s filmography. For the first installment of “Great Moments in Hong Kong Cinema,” I chose a stylish action scene from John Woo’s 1984 classic, A Better Tomorrow. 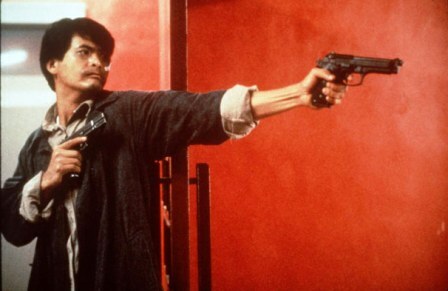 The sequence, partially an homage to Martin Scorcese’s Mean Streets, features a dashing gangster named Mark (Chow Yun-Fat) getting a little payback for his friend, Ho (Ti Lung). What’s so “great” about it? Well, you’ll just have to watch for yourself.